On Sunday, January 27, 2019, at approximately 7:40 pm, OFC Lewis responded to the Walmart on Solomons Island Road in Prince Frederick for the report of a person with a weapon. The Calvert Control Center advised that a white male, wearing a black jacket, camo pants, was seen in the parking lot with a machete. 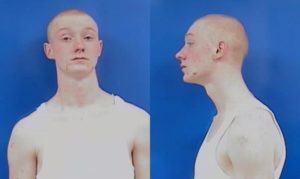 Upon arriving on the scene, the officer located a white male, later identified as Ronald Lee Russey-Thyes, 19 of Prince Frederick, matching the description walking towards the left side of Walmart. The officer activated his emergency equipment and ordered Thyes to stop and noticed that Thyes had an open 40oz bottle of Budweiser beer in his hand and a large knife strapped to his right leg. Thyes dropped the bottle of beer and was ordered to toss the knife away from his person, then he was placed in handcuffs. During the officer’s interaction with Thyes, the officer noticed a strong odor alcohol emitting from Thyes breath and person and had slurred speech. Thyes admitted to drinking Budweiser in the parking lot prior to the officers arrival and informed the officer that he had been staying in a tree house located in the woods next to Walmart. When asked, Thyes stated that his fiancé had bought him the bottle of beer earlier. A black backpack was also located on Thyes person and during the search, a small Tylenol bottle containing a white powdery substance was located in the backpack. Thyes told the officer that the powder was a crushed up Alprazolam pill which Thyes was unable to provide a prescription for. A large machete with an orange rope handle and a BB gun (pistol) was located in the backpack as well. 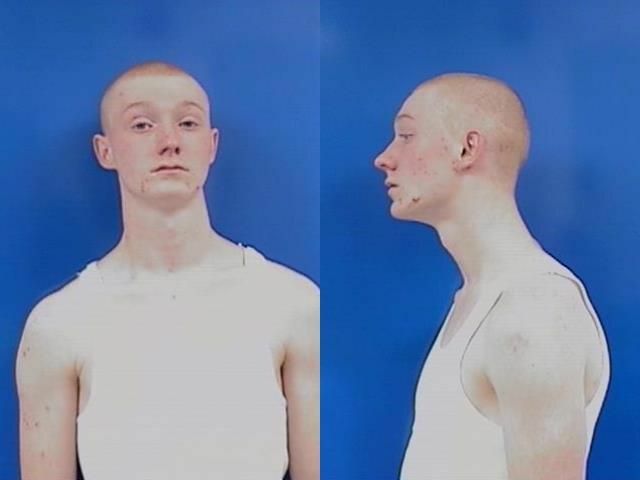 Thyes was transported to the Calvert County Detention Center and charged with CDS possess-not marijuana, dangerous weapon-conceal, consume alcoholic beverage in public, and intoxicated public disturbance. Thyes was released on a $1,000 bond on January 28, 2019, and is due in district court on April 19, 2019. This entry was posted on January 31, 2019 at 8:09 pm and is filed under All News, Calvert News, County, Law Enforcement, More News, z 600X120 Top Ad Bottom, z Police Ad Top. You can follow any responses to this entry through the RSS 2.0 feed. Muh dude needs some sun. Super white. Almost to the point where you can’t see a difference between the wife beater and his pasty skin. You need to write s-l-o-w-e-r…so he can read it. White males are dangerous and should be banned! Wow! I didn’t think he even had on a shirt in his mugshot! He looks like he could use a little mental help and maybe stay away from the alcohol! I wonder if he got heat in that tree-house? Man you really stuck your neck out there!!! Eminem is looking rough since Donald Trump put him in his place. Still “Griffith” ya big dummy. Wait wait wait. He’s living in a tree house and has a fiancé? Living in a tree house and he’s released. Bet he doesn’t show up in court. I remember having my first beer also, buck up Ronald! Straight outta Compton. Lol. Things will work out really well for him in jail. That’s on the other side of the river. That is only considered “beer” in St. Mary’s county! You people are disgusting Rude comments with your perfect little lives. How is it rude? He’s literally a criminal? Chill. Not perfect, but good enough to stay off of SMNEWSNET. It’s really not that hard though. Yes. When you don’t go to Walmart with a machete, a beer and a BB gun, that gives you the right to judge others. Like this wonderful citizen here. Where can I buy a new machete and BB gun? Walmart of course. Somebody hold my beer. What up Daddy Longneck?!!! I really love your videos! Slim Shady, I hope you are able to find a warmer place to stay. Forget about the tree house until the end of March. Released with no fixed address? He’s fixin’ to get one. …at the ‘cross bar motel’.